Like any great college town, Iowa City has plenty of funk and grit: those sports bars, dive bars, diners and inexpensive date joints that have endeared themselves to college students for decades. Indeed, any alum who revisits this university town will likely want to nip into such well-trod haunts as George’s Buffet, the Deadwood and the Airliner for old times’ sake. And when they do, they’ll be glad to see that although the beer selection has improved immensely, little else has changed beyond an update or two. But down the street, around the corner and even next door to such standbys, much has changed. 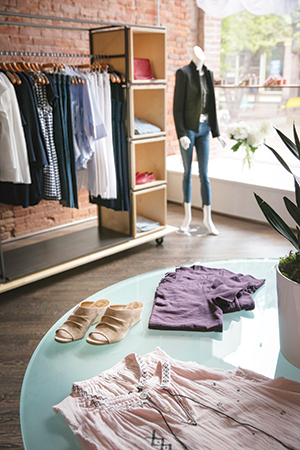 Elements of charm, worldliness and even luxury co-exist seamlessly with Iowa City’s enduring beat-and-earthy vibe. While the city still swells with football fans on home-game weekends, its cultural attractions, vibrant dining scene and other eclectic enticements all draw an equally ardent fan base. Here are up-to-date ways to experience the town. 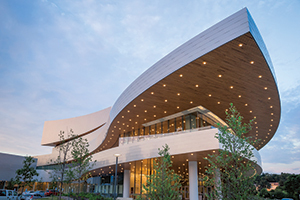 The new $176 million Hancher Auditorium opened in 2016, replacing its namesake, which was lost to the flood of 2008. Its sleek curves and glimmering lights beckon like an ocean liner from vantage points on the Iowa River. Auditorium. The name has designated the city’s top destination for the performing arts since 1972. That original auditorium on the bank of the Iowa River was ravaged by the flood of 2008 and eventually demolished. Built nearby, though a bit upriver, the new $176 million Hancher Auditorium opened its doors in September 2016. What a comeback! Its sleek curves, sparkling atrium windows and glimmering lights beckon like an ocean liner from vantage points up and down the Iowa River. Inside, the auditorium has fewer seats than before (1,800 versus 2,500), providing a more intimate connection between the performers and the audience. Synchronously, the eight sets of gallery seating above the main level add dramatic elegance to the space. Yet make no mistake: The new Hancher is not all about the auditorium. 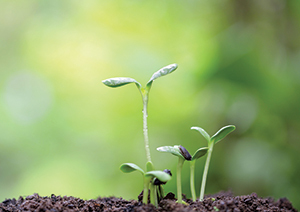 Hence, “come early, stay late” has become the catchphrase for this 21st-century cultural epicenter, and indeed, there are plenty of opportunities to do so. In the public spaces on multiple levels, expansive windows provide views of the surrounding campus, green space and the Iowa River. The Stanley Cafe, located on the second level, serves a variety of charcuterie, appetizers, desserts and snacks. The cafe opens two hours prior to Hancher performances, at intermission and immediately following performances. Adding to the grand-gala atmosphere, well-stocked bars throughout the building serve beer, wine, specialty cocktails and nonalcoholic beverages in fashionable glassware (no plastic cups for Hancher 2.0, mind you). In warmer weather, a flute of Champagne outdoors on the second-level terrace might just make it hard to head into the auditorium when the curtain bell chimes. Even if the timing of your visit to Iowa City doesn’t align with a performance at Hancher, you can pop in for a visit on Thursday nights, when the Stanley Cafe welcomes patrons from 5 to 7:30 p.m. Or, set your sights on a monthly “Culinary Experience,” when a designated local restaurateur serves drinks and appetizers on the lower level, followed by a dressy dinner in the Stanley Cafe. To find out what the 2018 season is bringing, go to hancher.uiowa.edu. 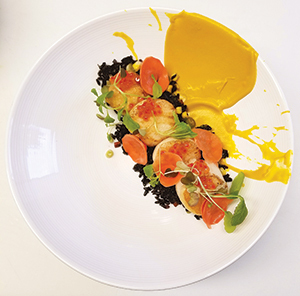 Chef Eric Johnson of Northside Bistro enjoys hitting sour, fermented, and natural salty flavors, as shown in this dish of scallops topped with fish roe and picked carrots. Iowa City might have the most concentrated food scene of any city in the state—cast a stone anywhere in or around downtown and you’ll likely hit upon a great place to dine. With metal chairs, brick walls and chunky booths made from reclaimed wood, Northside’s charmingly rustic interior belies the utterly refined food to be found here. Indeed, while the hearty house burgers might help keep Northside’s doors open (it’s in a college town, after all), this is the city’s culinary hot spot for highly original and detailed chef-driven food. Likewise, Johnson makes pastrami swing upscale-Midwestern by curing pork belly—instead of beef—for the pastrami and topping it with, among other delights, baby Swiss cheese from nearby Milton Creamery. A mustard puree and grilled pickled shallots add bursts of sunny-bright effects. That explains the interplay of fresh-forward and deeply layered ingredients in a recent fried catfish feature: It starred marinated oyster mushrooms and fermented carrots, along with a bright and herbal green-goddess dressing that gained added depth from bourbon barrel-aged fish sauce with dried shrimp. You should always pay attention to the evening’s features, as this is when the kitchen strives to blaze new trails; according to Johnson, he never repeats a special, no matter how well received. These recommended picks are listed on the spectrum from casual, to polished-casual, to fine dining. Cortado: Attention to detail and a conspicuous modern-European vibe distinguish this Italian-inspired coffeehouse from other java spots in town. Bluebird Diner: With its chrome tables, vinyl booths and a hodgepodge decor of kitschy yard-sale art, the Bluebird feels like an ironic throwback to a midcentury greasy spoon. Fortunately, the overall ethos is sincere. Expect gratifying diner-food updates, often scratch-made with locally sourced ingredients. A top spot for breakfast. Brix Cheese Shop and Wine Bar: This amiable little locale specializes in the aperitif—those light, refreshing sips that ease you out of your workday—along with satisfying nibbles that help you kick off the evening with aplomb. Don’t miss the apricot toastettes: irresistible sweet-hot mini-toasts topped with pimiento cheese, cider-reconstituted dried apricots and Calabrese peppers. Devotay: For craft cocktails and colorful, Spanish-anchored small plates, this long-standing Iowa City favorite hits that sweet spot between affordably casual and unmistakably inspired. Motley Cow: This irresistibly good-natured venue makes a great choice for a casual wood-fired pizza. Equally tempting, however, is the handful of thoughtful entrees, such as flat-iron steak frites with salsa verde or the kabocha fettuccine with green garlic and poached egg. Pullman Bar and Diner: Here, energetic chefs in the buzzy open kitchen infuse yearned-for diner classics with freshness—fresh ideas as well as fresh ingredients from local farmers and food artisans. For example, fig jam and field greens flavor-charge the grilled cheese, while smoked Fresno-chile aioli and bacon jam juice up a burger. Add craft cocktails, well-purveyed wines and craft beer, and you’ll enjoy a lively and sophisticated casual dining experience in the heart of downtown. Baroncini: No red-and-white checked tablecloths here: This sleek Italian site exudes the kind of understated elegance you might find at a ristorante in an upscale neighborhood in Milan, with food to match. Pastas are homemade, toothsome and tender; entrees include true-to-Italy meats such as veal, lamb and pork cheeks, alongside American crowd-pleasers like steak and salmon. If you’ve ever wished that Italian restaurants in your town were more like Italian restaurants in Italy, this is your spot. Stretch an overnight visit into a leisurely weekend with a few more can’t-miss attractions. Built in 1912 as both a live-stage theater and a movie house, this downtown icon originally hosted touring vaudeville acts as well as three-reel films projected on the large screen. After a fire in the 1920s, the Englert was retooled in the style of the ornate movie palaces popular at the time. A few decades later, it operated solely as a movie theater, and was eventually divided into two smaller theaters before closing in 1999. 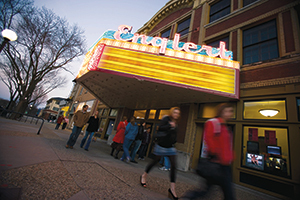 Reopened in 2004 and restored to its earlier grandeur, the Englert has revived its live-performance roots as a wonderfully intimate spot to enjoy music, comedy, poetry and more. The talent comes from near and far—with local, regional, national and international acts. Theater lovers, especially, will appreciate National Theatre Live programs, featuring HD video broadcasts of theater productions in London and elsewhere in the U.K. Past screenings have included “Of Mice and Men,” “A Streetcar Named Desire” and numerous plays by William Shakespeare. 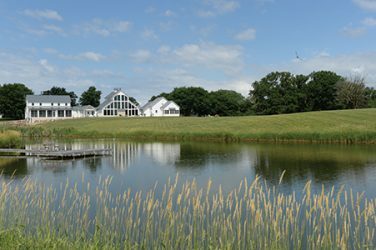 Many world-class writers have ties to Iowa; some, such as Amy Clampitt and Josephine Herbst, were born here, while others, such as W.P. Kinsella (author of “Field of Dreams”) were famously inspired by the state. And of course, legions of writers have passed through the classrooms of the University of Iowa’s famed Writers’ Workshop, either as an instructor, like Kurt Vonnegut, or as a student, like Flannery O’Connor. Iowa City’s Literary Walk pays homage to 49 writers with such ties to Iowa. As you amble along either side of Iowa Avenue—the street that’s visually crowned by the Old Capitol to the west—you’ll spot bronze panels embedded in the sidewalk. 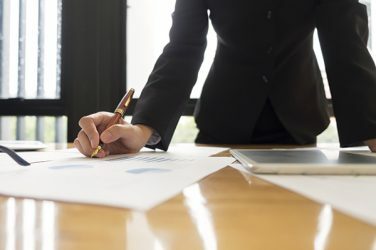 Each offers a passage from the featured author’s work and explains his or her tie to the state. These panels are connected by a series of famous quotes on writing and literature by luminaries from Mae West (“Keep a diary, and someday it will keep you”) to Friedrich Nietzsche (“Creation … a great redemption from suffering”). John’s Grocery: Though Iowa City alums “of a certain age” might recall this as the place to get a keg of PBR or score inexpensive deli grub, John’s has evolved into a sought-out destination for the largest selection of craft beer in the state, along with well-purveyed wines from around the world. 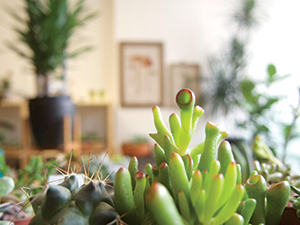 The delicate beauty found at Moss, an East Washington Street boutique, engages and inspires indoor gardeners. Moss: Designed for the indoor gardener, this uplifting indoor garden boutique showcases plants as living sculptures that add beauty and serenity to our lives. New Pioneer Food Co-op and Bakehouse: Bring a cooler, and before you head home stock up on a supply of natural and organic food. Standouts include terrific bakery items, locally grown produce and an admirable meat case that features humanely raised, antibiotic-, hormone- and steroid-free beef, lamb, pork and poultry. If a long drive is ahead of you, pack a picnic with fresh and colorful finds from the deli case. Prairie Lights Bookstore: A community that’s recognized as a City of Literature by UNESCO demands a legendary bookstore. Suffice it to say that Prairie Lights measures up. This time-honored shop offers three and a half stories of bibliophile heaven, including extensive poetry, fiction, nonfiction and children’s sections. Be sure to check their “Live from Prairie Lights” schedule, a reading series that features both emerging and well-known writers. The cafe makes a pleasant spot for coffee and a pastry in the morning, or a glass of wine and a small plate later in the day. Velvet Coat: Yes, this upscale women’s apparel shop might require a splurge—but it’s so worth it when you score that classic, well-made find that you’ll wear and love for years.